How It Affects Our Health And Emotions. Includes list of essential oils to balance crown chakra or purple chakra. Chakra 7. Sometimes referred to as the "Purple Chakra" The crown chakra exists above the head and spools like a vortice, it's root being where a baby's soft spot appears on its head. It resonates on the color violet which is the color that has the highest frequency in the visible light spectrum.  The next frequency up vibrates too fast for us to see and so in physics any light frequency faster than violet is known as invisible light. The fact that the purple chakra color is so high in the frequency manifests as the closest to the Divine. To God if you like. This is the chakra that helps you to connect with the Godhead, Be that Yahweh, Buddha, Shiva...whomever, it is a connection with the creator and the energies of the universe, with the divine. The crown chakra has the most fibres with a massive 972. This chakra is all about communication with the Divine and the opportunity to achieve enlightenment. Its vital lesson is about living a spiritually generous life in the here and now. It is the crown chakra that is our access to oneness to the universe. Meditation can of course stimulate the energy of the votices but you can also use well chosen essential oils to empower them which in turn will purify and strengthen the chakra colors too. As already stated the crown chakra sits on the front of the head and as such is connected to the both the right eye and the pineal gland amongst whose functions govern wake and sleep. This purple chakra governs the entire brain and endocrine and nervous systems. The truest sense of this chakra is total empathy, the sense of being able to step outside of your own body and reality and experience someone else's totally. There are times when we all live a life less than that. When we are divorced from this kind of quest. When we are bigotted and argumentative, when we don't feel life and the joys that are around us, when apathy begins to drag us down. When this kind of antipathy begins to take hold, then our brain chemistry starts to take hold. Depression begins to creep through our ways of thinking. We become closed to those around us. We can no longer feel any empathy for other peoples' experiences. We begin to refuse to listen to advice and learn from advice or experience. These are classic signs of a dysfunctional crown chakra. As one would imagine the illnesses and diseases connected with the crown chakra are ones related to these organs. It's important to remember to that the energy flows backways and forwards. Emotions send messages to the organs which sets up disease, but also in the same way the diease may be genetic and so will be transmitted back and seen in the chakras. For example it would be usual to see the effects of a disease of the nervous system such as Multiple Schlerosis reflected in the way that the crown chakra works. That would not indicate that the disease originally manifest from here. It would be interesting however in treatment of a patient that exhibits this kind of phenomena, to note the effects of aligning chakras would have on their overall condition. Certainly they could not be cured of course, but they may find that their general wellness may see some improvement from this. Use in an essential oils burner, massage oil or in the bath. As already stated that this purple chakra sits on the front of the head and as such is connected to the both the right eye and the pineal gland amongst whose functions govern wake and sleep. This purple chakra governs the entire brain and endocrine and nervous systems. There is a wonderful chakra singing bowl meditation on this page to support your essential oil healing. Don't forget if you need reminders about how the Crown purple chakra fits into the location, there is a reference chart on this page.